The bench press is a staple exercise among body builders, power lifters, athletes, and the average weekend-warrior lifter. If there’s one lift anyone knows how to do, or at least ‘thinks’ they know how to perform correctly, it’s the bench press. Bench pressing is more than just getting under that bar, lifting it off, and praying you can get the weight back on the rack without embarrassing yourself. We’ve all been there and know that feeling. All it took was that one weight drop and feeling of helplessness that led many of us to learning how to bench properly. If you are looking to improve your bench press, these 7 tips will help you avoid injury, learn proper benching form, and increase your overall chest strength. While the chest is the main muscle targeted through this exercise, it’s not the only one. Bench pressing is a compound movement, meaning it incorporates multiple joints and muscle groups to perform the exercise correctly. Muscle groups, other than the chest, that assist in completing the bench press movement include your triceps, shoulders, lats, and legs. We all have stronger and weaker muscle groups throughout our body. A compound movement like the bench press incorporates a variety of different muscle groups, which means more areas to have a potential weakness within. Until you acknowledge what muscle groups in your body are weak you aren’t going to reach your full bench potential. Dropping the weight to your chest and getting stuck at the bottom of the press movement means your lats and shoulders are weak. 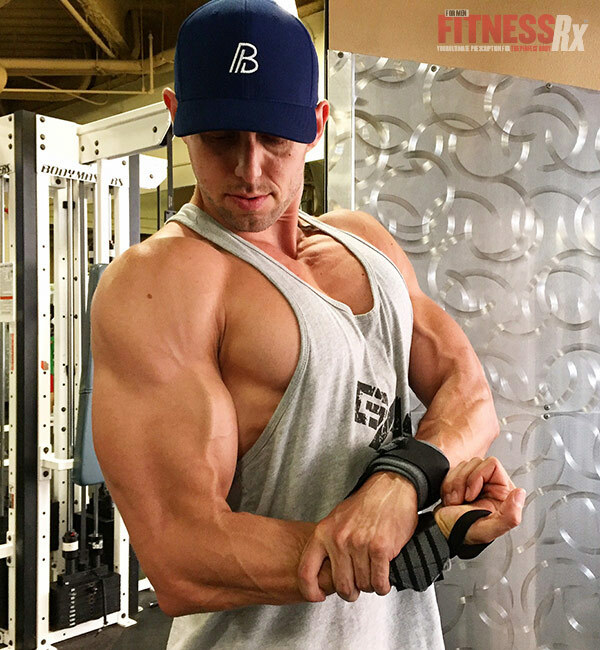 Incorporating more volume of movements such as standing overhead barbell presses and single arm dumbbell rows will increase your lats and shoulder strength, allowing you to get that bar off your chest. If you’re able to get the bar off your chest, but you’re getting stuck in no-man’s land half way up and unable to lock out, then you need to strengthen your triceps. 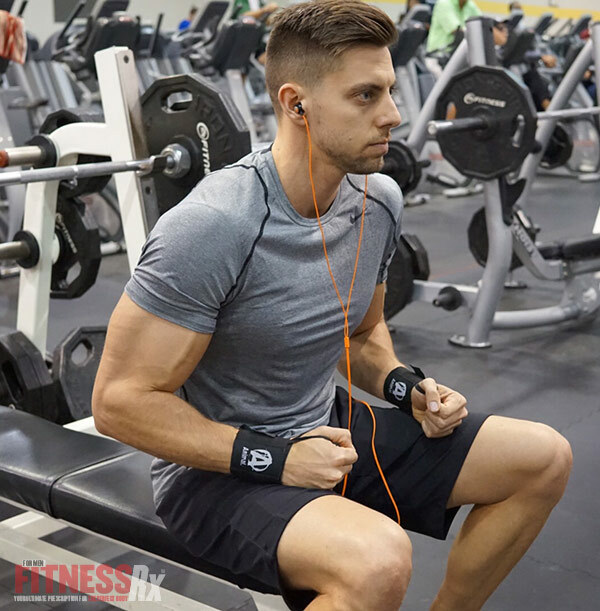 In order to strengthen your triceps incorporate more sets and reps of close-grip bench to mimic the bench press movement while building strength in your triceps. As with all lifts, form is crucial for targeting the intended muscles in a particular lift and maximizing muscle growth within the muscle group. Using the word itself, this is a simple acronym to remember before you lift that weight off the rack. Two reminders for the letter F. Getting your feet planted is the first thing you want to do when lying down on the bench. Position your feet where you want them to be during your lift and cement them there. Drive your heels into the ground as if you were getting ready to perform a squat. When benching a lot of the power is coming from your legs so keep them firm and dig those heels in. Step two is finding your grip. My advice on this is to find a grip that’s the most comfortable for you. The most important thing to focus on with your grip is making sure the grip position is keeping your elbows tucked and tight. 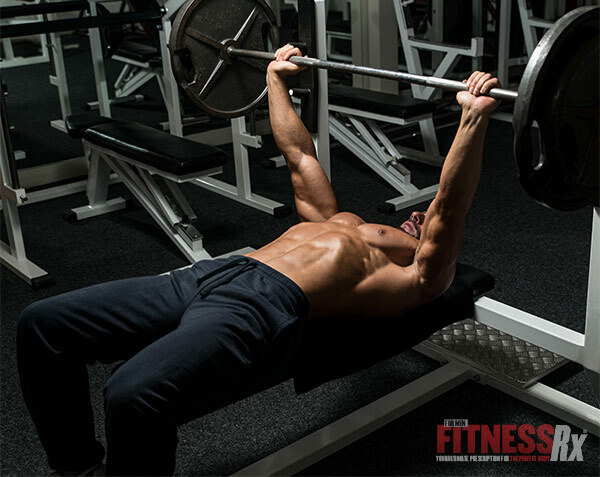 Wide, flailing elbows are going to lead you to a weaker bench press and put stress on your shoulders. Now that you’ve got the bar off the rack and you’re lowering the weight, make sure you are lowering the weight to just below your chest, near the top of your sternum. Don’t bring the weight down to the top of your neck or down to your belly button. Keeping the sternum positioning with the weight is going to give you the most power when pushing the weight back up. So you’ve lowered the weight down. Now the tough part; getting it back up. When pushing the weight back up you want to raise the weight straight up. You don’t want to push the weight forward towards the bottom of your body or up towards you chin. Pushing the weight straight up engages all the muscle groups working within this compound movement correctly, allowing for an optimal pressing movement. Keep your form, drive that power from the heels of your feet to your chest, and move the weight up with power and confidence. If you’re working out with someone stronger than you or the guy before you didn’t rack his weight, don’t sacrifice your form and set/rep goals because you think you can lift what he was lifting or your training buddy is using a heavier weight than you normally use. Drop or add the weight to a weight that is appropriate for your training goals. Too many times I see people working out with a weight that is too heavy or too light for them because of their training partner. Your strength goals are yours and no one else’s so workout appropriately, so you shouldn’t base your training on somebody else’s goals. It’s important to create a program or find a program that focuses on progressive overload to build the muscle and strength over time. Slowly increasing weight and training in the 5-8 rep range is key to hitting that new one rep max you want. Find a program, stick to it, and max out appropriately. If you are going to try and hit a new one rep max then swallow your pride and get a spotter. If you can’t find a spotter or you are lifting in your home gym then I recommend setting up spotter bars before throwing that 3rd or 4th plate on the bar. I’ve got faith in you that you’re going to get that weight up, but it’s important to stay safe when lifting heavy. Also, dropping the weight on your neck while your gym crush is watching is never a good look. Equipment can play a huge part in helping both your bench pressing form and max lift. If you have a weak grip or weak wrists, wrist wraps are a great tool to use to help you keep the bar tight and secure in your hands. Using a Slingshot will help you understand where your elbows should be when lowering and lifting the weight. Also, using bands or chains is a fun and effective way to do something different with your bench press reps, increasing and decreasing the feel of the weight as you lower it and raise it.